You may have noticed the "Popular Posts" list over in the right-hand sidebar of this blog. This widget tracks the most popular posts on this blog in the last 30 days. For the last twelve months - give or take a week or two where it may have dropped to number two or three - the most-viewed post on this site has been the "Erin Gray/Wilma Deering Gallery." I can't say I'm surprised. Not only was Ms Gray's Wilma Deering stunning in shiny spandex, she was a strong, courageous, intelligent and fiercely feminine icon of the Space: 1970 era with a devastating smile and the sexiest laugh ever heard on TV. 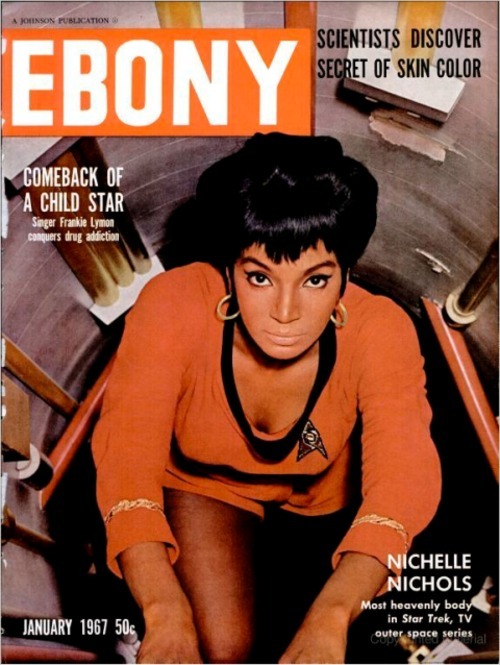 Star Kids of both genders couldn't help admire her... and that admiration and affection continues today (anyone else watch her on The Guild?). I hereby pronounce her the "Ultimate Space Babe!" 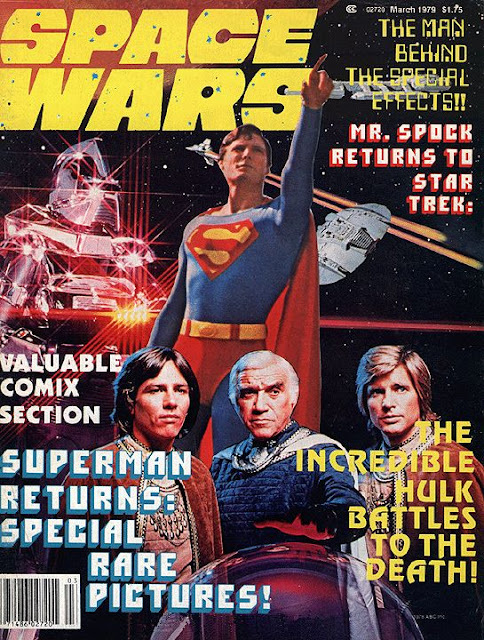 Here's wishing all Star Kids - those who grew up in the Seventies with the sci-fi shows, movies and memorabilia of the era, and those of subsequent generations who discovered this stuff years later - a very happy, safe, and space opera-filled New Year. Enjoy a toast of Saurian Brandy, Tranya or ambrosa tonight (drink responsibly - that stuff has a helluva kick), and I'll see you all here again on the 2nd. Not strictly sci-fi, but close enough for my blog, Korg: 70,000 B.C. was a 1974 live-action Saturday morning children's series revolving around the day-to-day struggle for survival of a family of (English-speaking) Neanderthals. 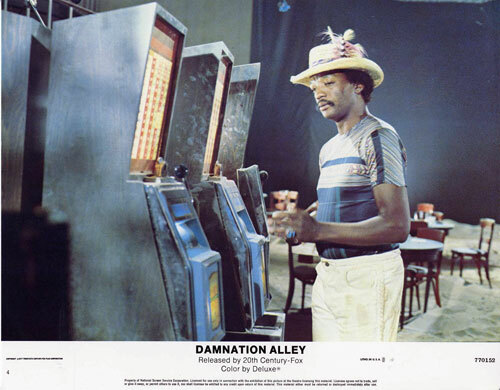 Created by Fred Frieberger (producer of Star Trek Season 3 and Space: 1999 Year 2), the show was a rare foray into live-action by Hanna-Barbara and starred Jim Malinda as Korg. A plaintive hunting horn, heard over a ruddy sunrise, signaled the start of something different on Saturday mornings in the mid-seventies. Clan Korg had arrived to take kids and kids at heart on a series of live-action anthropological adventures across the dangerous terrain of prehistory. Aided by consultants from both New York's American Museum of Natural History and the Natural History Museum of Los Angeles County, Korg ditched battling dinos and discovering fire for a more mature focus on the dawn of cooperation and compassion amongst our Neanderthal brethren as personified by it's pre-nuclear family. Korg is the patriarch of the clan, which includes Mara, his mate; Bok, Korg's younger brother; and Korg's three offspring: Tana, 15; Ree, 12; and Tar, 11. Together, they brave opposing tribes, cave bears and fire while discovering the roots of art, diplomacy and commerce in the world of 70,000 BC. 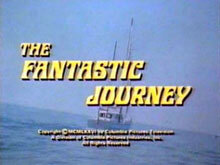 Burgess Meredith narrates. I'm not quite sure how I missed it, as I usually try to stay on top of releases from Warner Archive, but I guess they released the complete series of Korg earlier in December as a 2-disc Manufactured-On-Demand DVD set containing all 16 episodes. 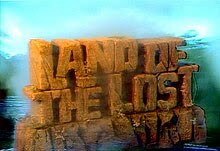 I can't say I remember the show well; I rarely watched it, preferring the more fantastic primeval thrills of the Land of The Lost. 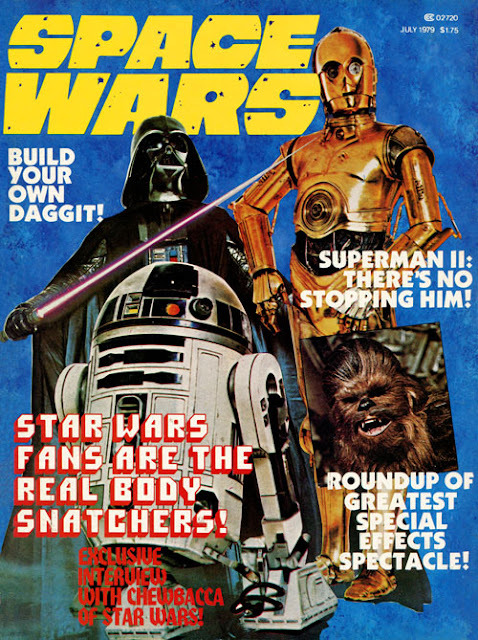 But I do know that it had its fans among the era's Star Kids. 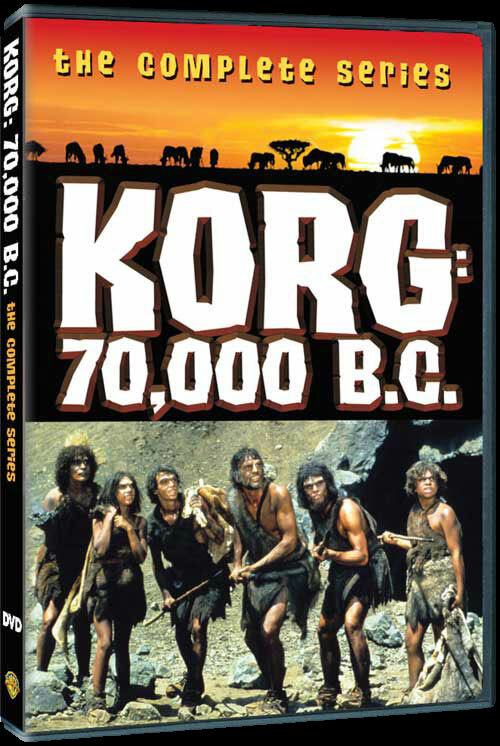 The discs can be ordered directly from Warner Archive or through Amazon: Korg: 70,000 B.C. 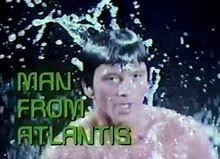 Following up on yesterday's great Westworld/Futureworld news, here's the original theatrical trailer for Richard T. Heffron's return to the Delos resorts, where nothing can possibly go wrong... again. Futureworld. Enjoy. Here's some good news for those of us Star Kids who are equipped for HDTV: Warner Home Video will be releasing the 1973 Michael Chricton killer android thriller Westworld, starring James Brolin, Richard Benjamin (Quark) and the unstoppable Yul Brynner (The Ultimate Warrior), on Blu-ray disc in March of 2013. 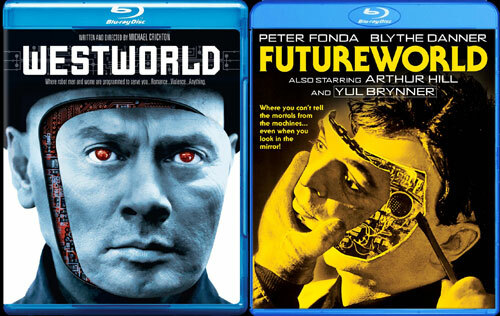 And in a nice bit of marketing syncronicity, Shout Factory has licensed the rights to the 1976 American-International-produced, Richard T. Heffron-directed sequel, Futureworld, starring Peter Fonda and Blythe Danner (with a cameo by Brynner) and will also be releasing it on Blu in March! I can't wait! 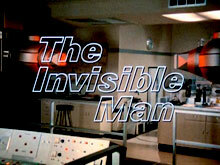 Wouldn't it be extra-cool if Warner Archive would take this opportunity to unearth from the vaults and dust off the short-lived 1980 television series Beyond Westworld at the same time? 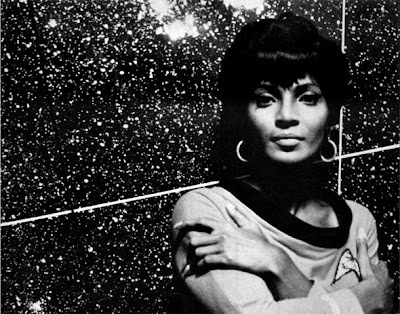 Here's wishing the multi-talented Nichelle Nichols - the Star Trek franchise's first, best, and (with apologies to Ms. Saldana) sexiest Lt. Uhura - a very happy and joyous 80th birthday. 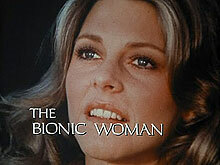 Ms. Nichols was the Space: 1970 Space Babe for January, 2011. 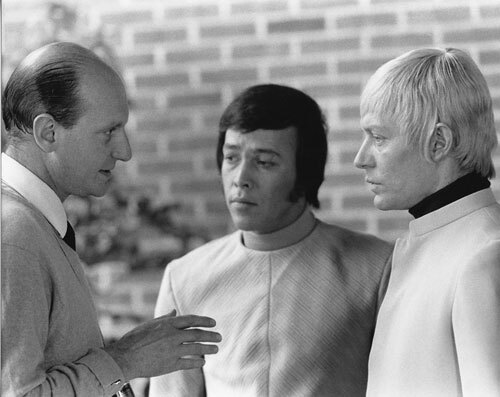 The late producer Gerry Anderson on the set of his first live-action sci-fi television series, UFO, having a very serious (it would appear) conversation with actors Peter Gordeno (SkyDiver One Captian/Sky One pilot Peter Carlin) and Ed Bishop (SHADO Commander Ed Straker). 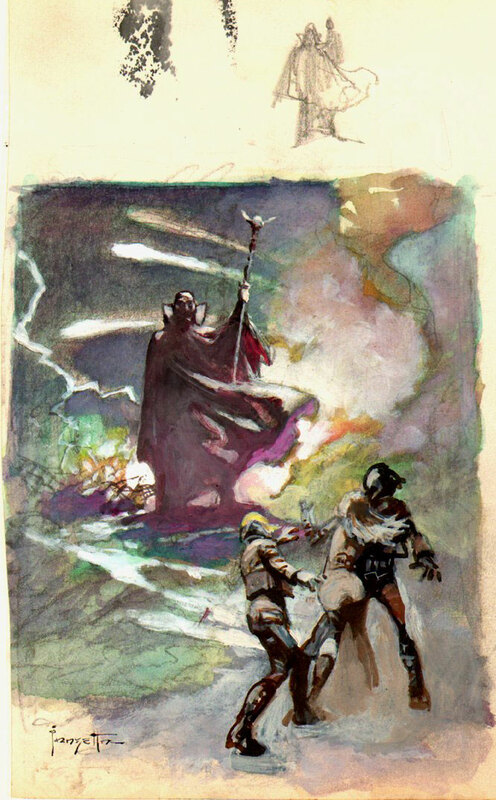 Although I rarely draw anymore - and I never could paint worth a damn - I attended art school back in the dim history of my youth, so I'm always appreciative of good illustration and fascinated by artists' processes. 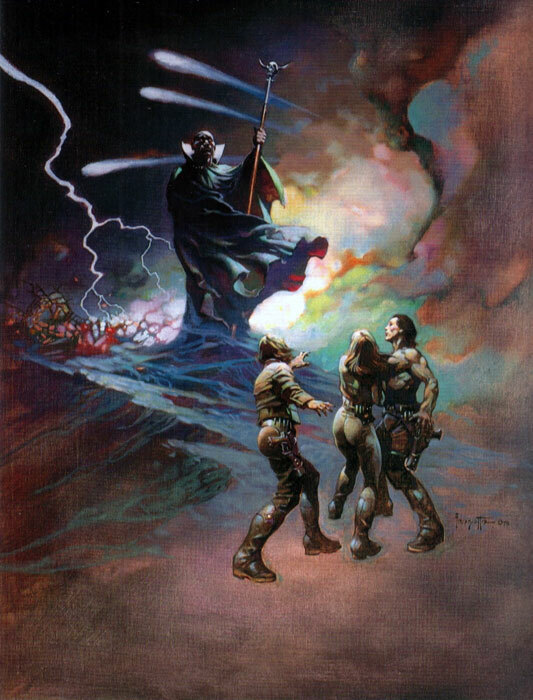 This cool find is legendary fantasy illustrator Frank Frazetta's color rough for his fourth Battlestar Galactica painting, which was used by Universal and ABC to advertise the "War Of the Gods" two-part epic episode. I've re-posted the finished painting and the ultimate TV Guide advertisement below for comparison. 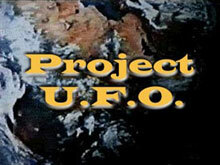 I've just learned that producer Gerry Anderson, creator of the Space: 1970 television favorites UFO and Space: 1999, has passed away at age 83. 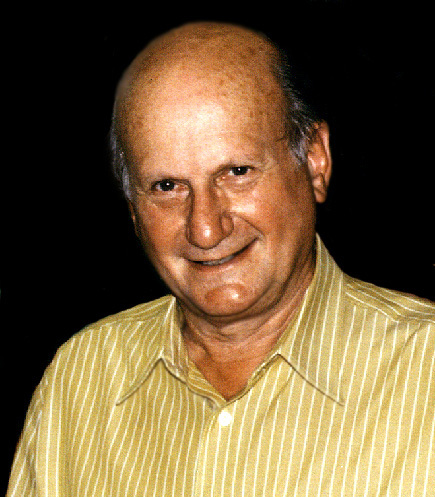 Anderson, who also produced the 1969 sci-fi feature, Journey To The Far Side Of The Sun (a/k/a Doppleganger), the TV special, The Day After Tomorrow: Into Infinity, and the 1990's program, Space Precinct, was diagnosed with mixed dementia two years ago, and moved permanently to a care home in October of this year. He leaves behind four children and his widow, Mary. Of course, in England and elsewhere, he is probably best-known for his "Supermarionation" programs - including Fireball XL-5, Thunderbirds, Supercar, Stingray, Terrahawks and Joe 90 - which combined sophisticated puppetry with extensive miniature effects. Many of these shows aired in the U.S. during the 60s and 70s, but didn't have quite the cultural impact here that they did at home. 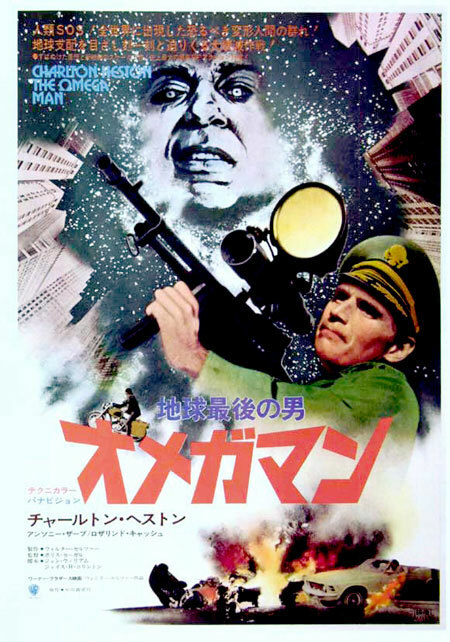 Obviously, I am a huge admirer of Anderson's live-action genre efforts. 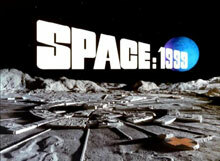 Space: 1999 and UFO are both milestones in the realm of 70s sci-fi, and classics of their kind. 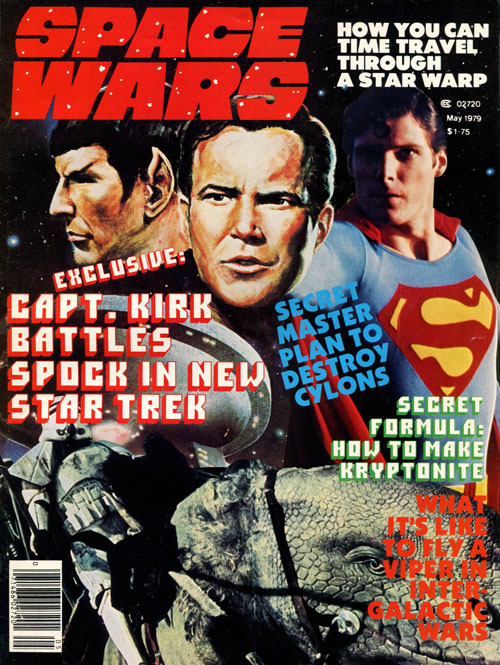 Thirty-two years ago(!) 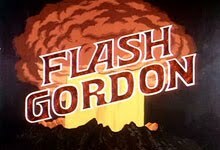 the Dino de Laurentis/Mike Hodges feature film adaptation of the Alex Raymond Flash Gordon comics strip hit U.S. theaters - a holiday treat for genre fans. 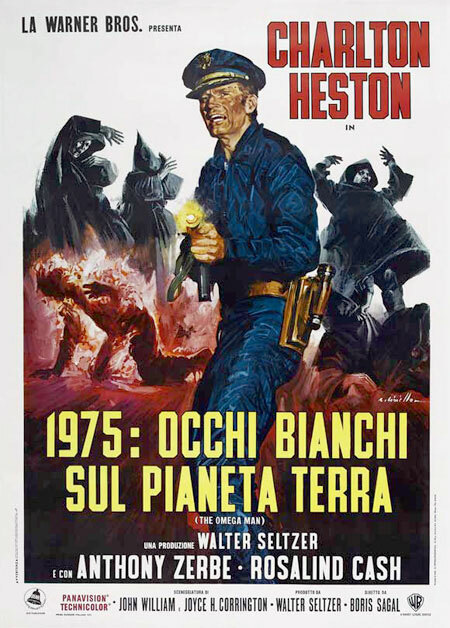 A colorful, enjoyably campy interplanetary romp, it remains one of my favorites from the era. Hell, I watched it again Christmas night! Sure, someday I'd like to see a talented filmmaker craft a more "serious," swashbuckling adventure take on the material, but I've been reading a lot of Flash comics over the last two weeks, and to be honest, they're actually pretty damned "campy" - if unintentionally and un-cynically so - in their own right, so the 1980 film is a legitimate (and faithful, in its way) approach to the material. 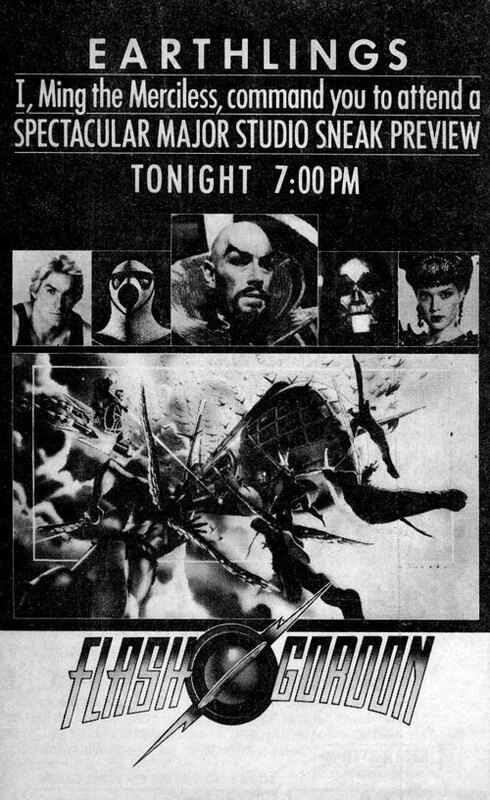 Here's a cool newspaper advertisement for an advance preview showing of the film, probably from the first week in December, 1980. Best wishes from R2-D2, C-3PO and all of the busy droids and robots here at Space: 1970. 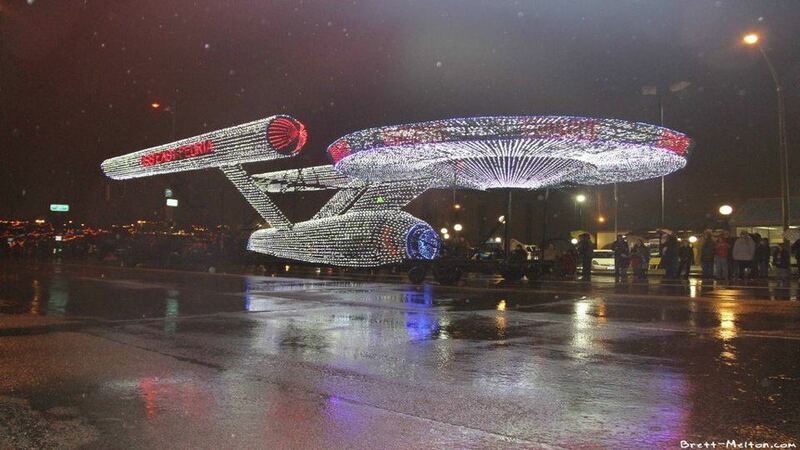 Have fun, stay safe, and we'll see you all here again after the holidays - whichever holidays you celebrate - with a lot more sci-fi memories from the analog age! 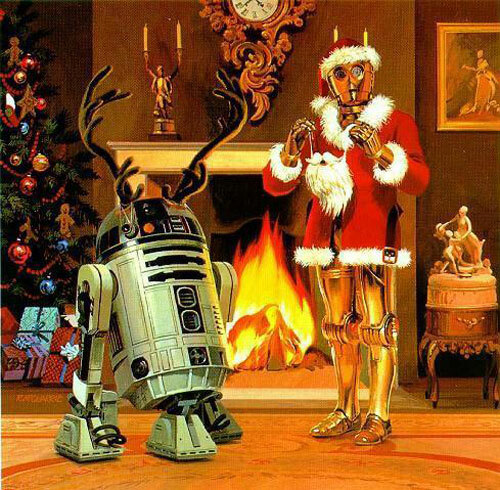 What Do You Give A Wookie For Christmas? 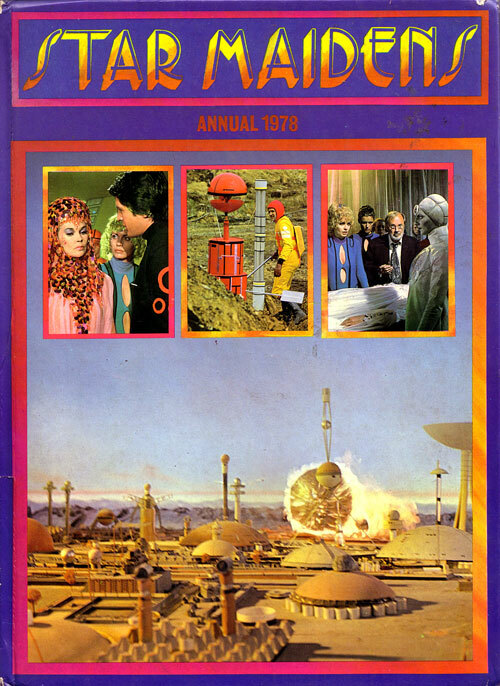 Things are likely going to be a little quiet here at Space: 1970 for the next few days. Here's wishing all Star Kids - no matter who they are or where they're from - a peaceful and joyous holiday season. • I'm a big fat, lousy liar. 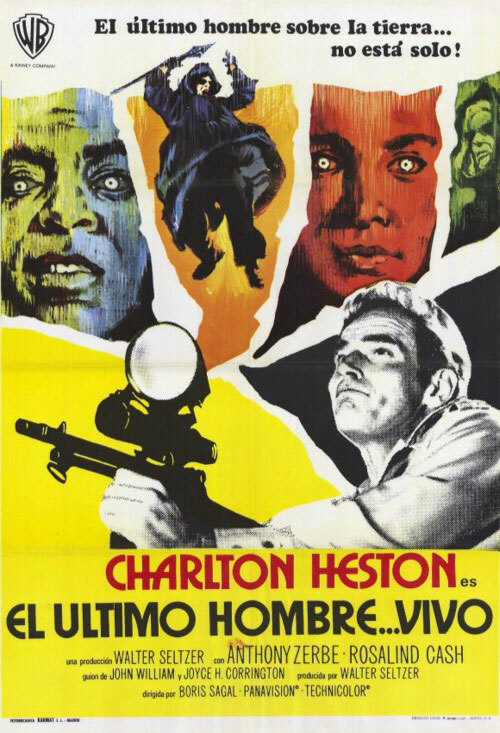 I promised that if the world didn't end today, I'd post my long-delayed review of The Omega Man this afternoon. But I'm not going to do it. Not today. Fact is, I'm not feeling well, and I just don't think I'm up to re-watching the movie, writing a long post, and then taking and formatting screenshots. Also, I have to make a long drive early tomorrow morning, so I think I need to get some rest this evening and hit the sack early tonight. I'll try and get it posted right after the holiday (maybe before, but I'm not going to count on it). Your patience is appreciated. 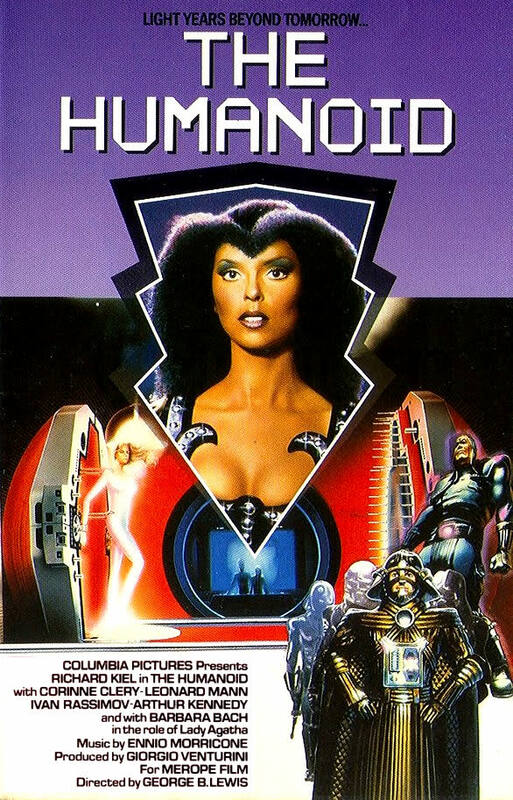 • In completely unrelated news, I received a copy of The Humanoid in the mail yesterday and watched it last night. I actually thought it was slightly better than its reputation. The sets, locations, costumes and miniatures (derivative as many of them were) were surprisingly decent, and Barbara Bach as the evil Lady Agatha was just stunningly hot, even with her funky hairdo. Hell, I even liked the robot dog. 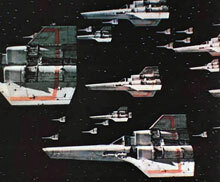 My only real complaint is that there weren't enough space battles! Ultimately, although it wasn't as much giddy fun as Starcrash, I enjoyed it, and am grateful to have finally seen it. One of these days (maybe after New Years), I'll write it up properly. Another image-centric blog post! Man, I'm getting lazy. 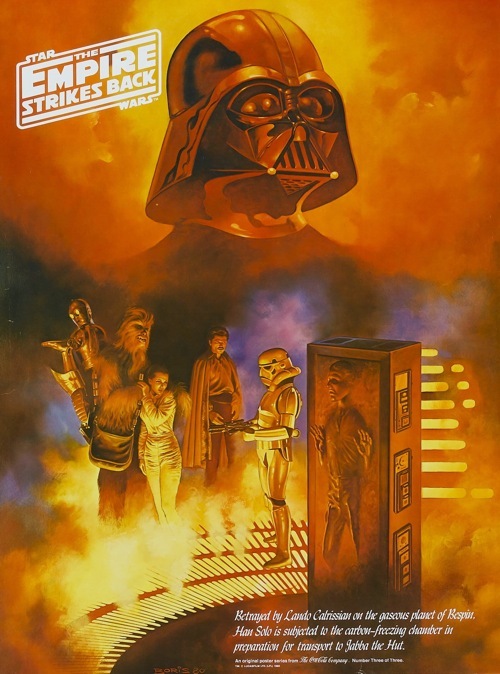 Anyway, when The Empire Strikes Back premiered in 1980, acclaimed fantasy artist Boris Vallejo (whose Buck Rogers and Flash Gordon images from the period are also memorable) was commissioned to paint these dramatic posters as premiums for Coca-Cola. I don't recall if these were available at fast food restaurants or at theaters. Can someone who actually remembers let me know in the comments? ADDENDUM: From the comments, it appears that these posters were available at both the Burger Chef/Burger King restaurants and at "participating theaters!" I finally have my first British sci-fi Annual in my Space: 1970 library! And it's all thanks to Star Kid Robin Groen, who generously sent me a copy of the 1978 Star Maidens Annual, published by Stafford Pemberton Publishing Co., Ltd. As with most of these uniquely British collectibles, it's a slender hardcover with a number of prose stories, photos, articles, puzzles, colorful illustrations and a short comic story. 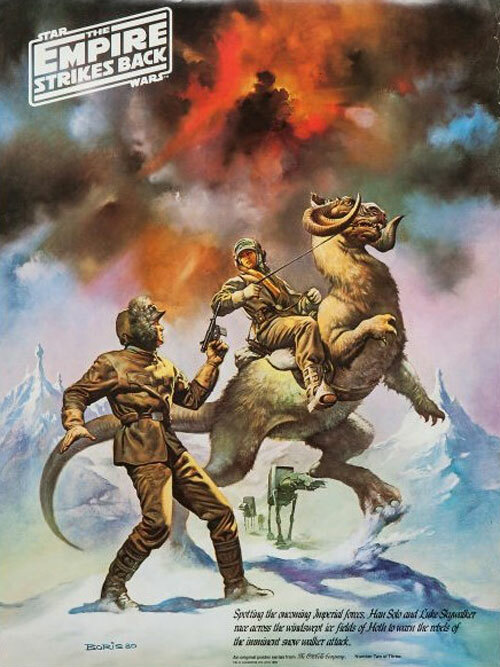 As I have mentioned, I did order the Star Maidens DVDs from the U.K. a while back, and I will make a point of reviewing the short-lived series - which is actually pretty interesting in a decidedly 70s way - early in 2013. 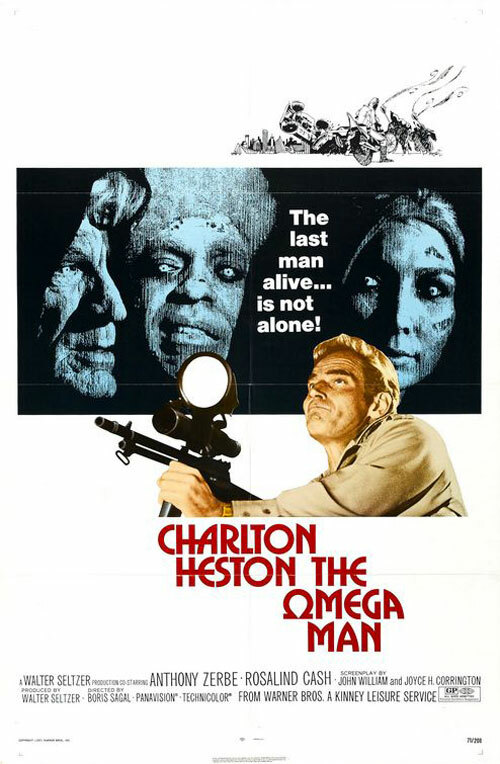 Just in case the world does end tomorrow, I thought I'd pay tribute to one of the other well-known post-Apocalyptic science fiction films of the 1970s - Boris Sagal's The Omega Man, starring 70s genre icon Charlton Heston (Planet Of the Apes, Soylent Green) as the last man on Earth. 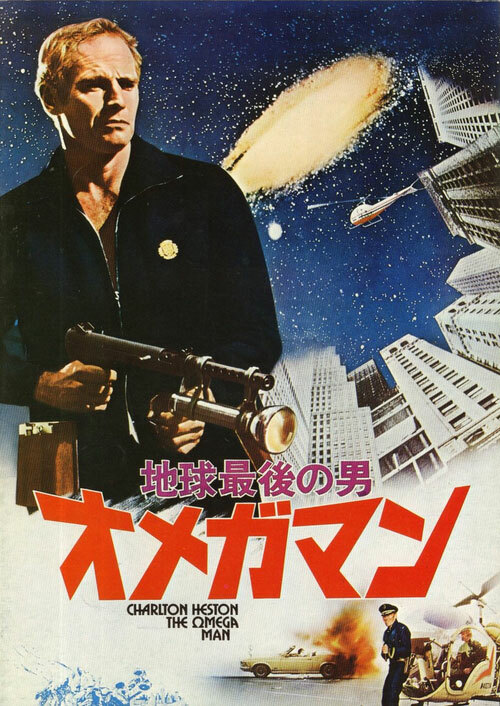 Long-time readers of this blog may remember that two years ago this month, I attempted a "theme week," devoted to the End Of The World cinema of the Space: 1970 era. 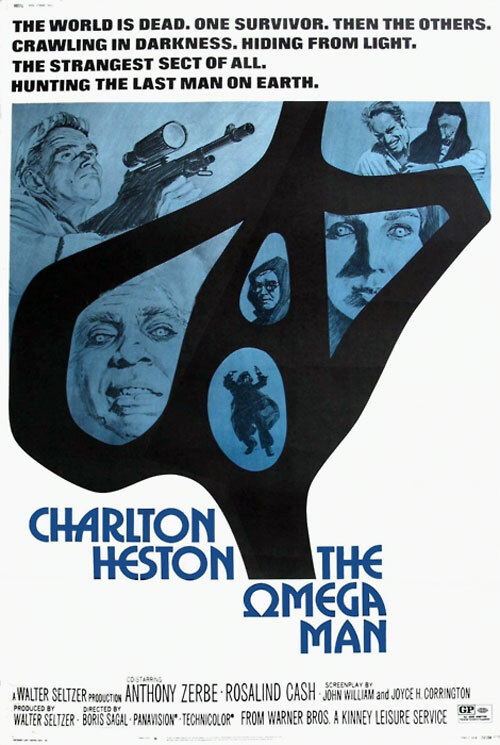 I didn't quite pull it off (although I did manage a few decent posts, I thought), and my greatest "failure" of that theme week was that I never got around to my promised review of The Omega Man. 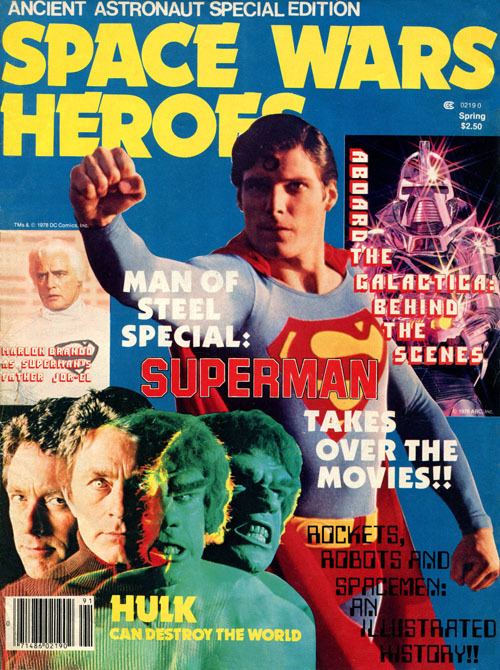 Back in 1977, 20th Century Fox had high box-office hopes for a big-budget science fiction film that they had scheduled for release that summer. 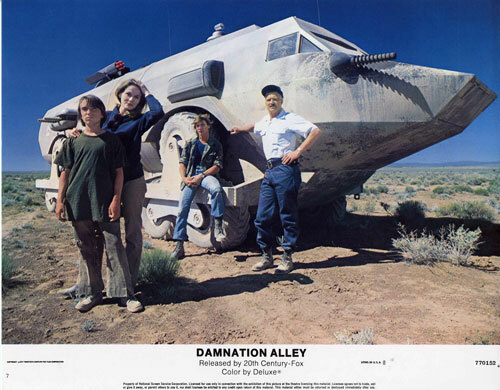 That film was not George Lucas' Star Wars, but a post-Apocalyptic road movie (very) loosely based on a novel by science fiction author Roger Zelazny, titled Damnation Alley. 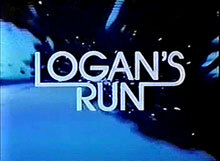 Starring Jan-Michael Vincent, George Peppard, Jackie Earle Haley, French actress Dominique Sanda, and Star Trek II's Paul Winfield. 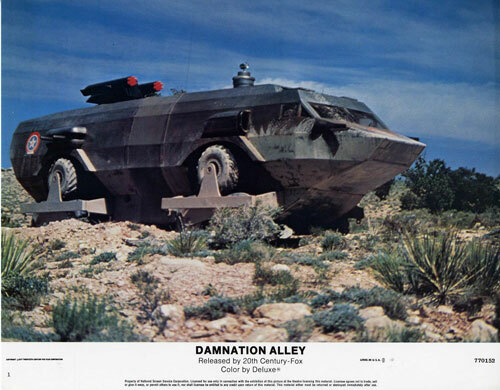 Damnation Alley is a bit of mess, with uninspired direction by journeyman director Jack Smight (The Illustrated Man). Also, the screenplay by Allan Sharp & Lukas Heller is pretty stupid, discarding virtually all of the Zelazny source novel in favor of an episodic, nonsensical road trip with glowing "radioactive" skies, photographically-enlarged arachnids, rubber roaches, utterly ludicrous pseudoscience - and an absurd "happy" ending. 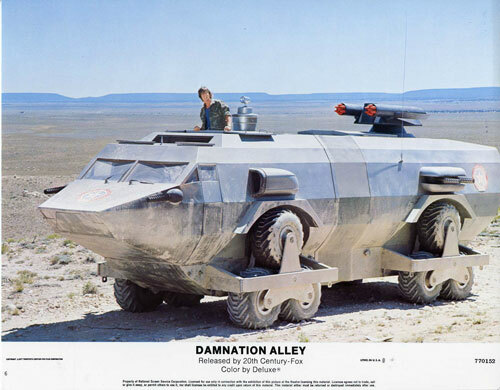 The sole redeeming cinematic element of the film is the Landmaster vehicle itself - a formidable, super-RV with a unique tri-wheel drive, armor plating and missile launchers. Built at a reputed cost of $300,000 - $350,000 by Hollywood custom car guru Dean Jeffries, the Landmaster is undeniably cool. Which is, obviously, why it played such a prominent role in the film's advertising... including these lobby cards. 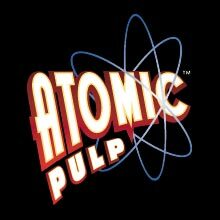 I generally don't use the adjective "cheesy" when describing vintage genre films; too often it's just a euphemism for "old" used by those with a lack of perspective or appreciation for anything created before their birth. 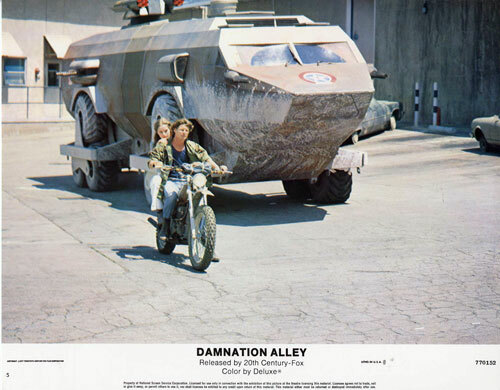 But Damnation Alley - from its dumbed-down script to its sloppy (even for the time) optical effects work - is a cheesy science fiction film. 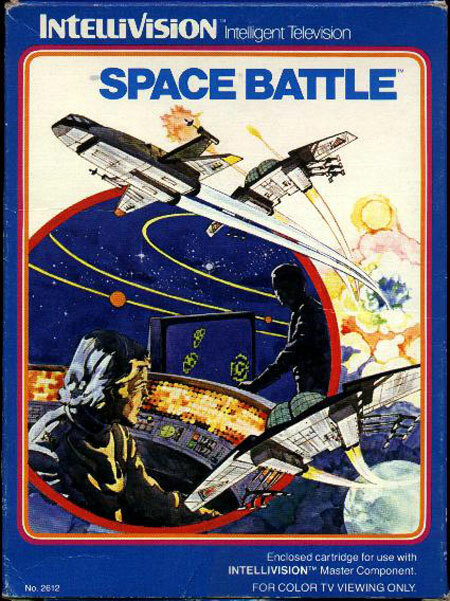 In 1979, Intellivision released a video game cartridge called Space Battle. 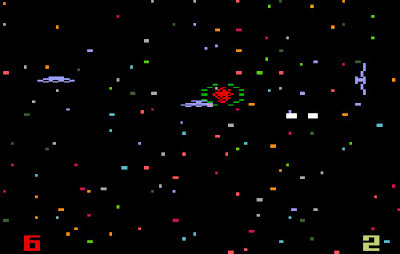 Produced by APh Technological Consulting for Mattel, the game was pretty typical for its time, with the player tasked with shooting enemy spaceships out of the sky with a targeting crosshair sight. 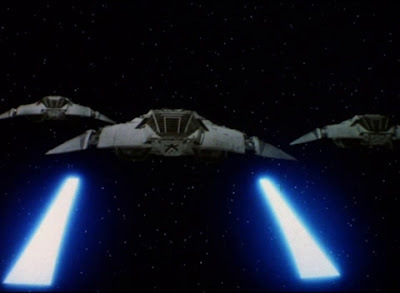 The ships were vaguely pancake-shaped, sported twin laser cannons, and often employed a distinctive "flipping" maneuver in order to evade the player's shots. 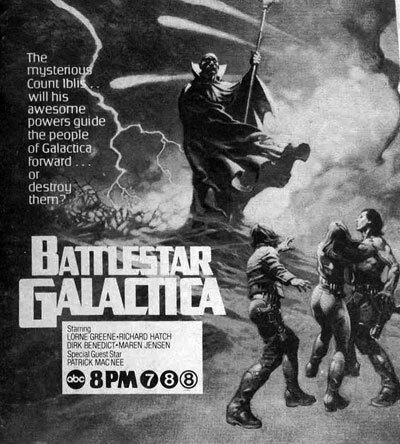 Legend has it that Mattel, having the license for the Battlestar Galactica toys, assumed that their license included video games, and put their team to work creating a Galactica game cartridge. Well, supposedly it turned out that they didn't have those rights after all, so they quickly had the game altered to remove text references to the television series and changed the name. I don't know that this story is true, but it has a reasonable ring of verisimilitude, considering the timing and the company involved. Of course, it may also have been that they did have the rights, but as the show wasn't renewed after its first and only season, Mattel decided to simply change the name and not pay Universal the licensing fee. I like the package art. Those ships certainly resemble thinly-disguised Vipers and Cylon Raiders, don't they? 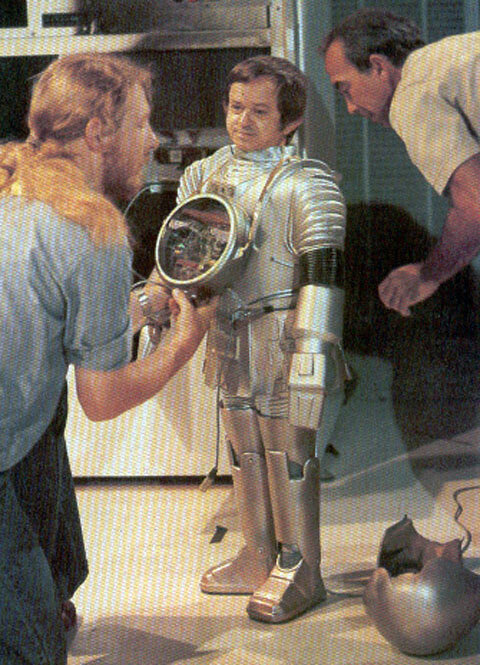 Another performer suits up as a robot - in this case, it's Felix Silla as the wisecracking ambuquad TWIKI (voiced primarily by Mel Blanc) in Universal's 1979 film and subsequent NBC television series, Buck Rogers In The 25th Century. Genre vet Silla also portrayed (in conjunction with Johnathan Harris' voice performance) the IL- Series Cylon "Lucifer" (and, presumably "Spectre" as well) on the original Battlestar Galactica, as well as an Ewok in Return Of The Jedi. 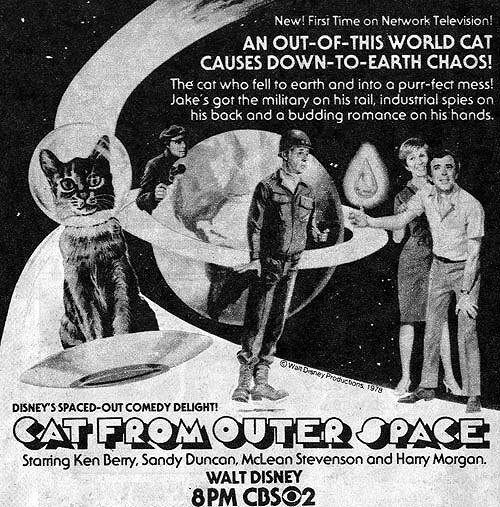 I won't claim that Disney's 1978 kiddie comedy, The Cat From Outer Space, is one of my favorite 70s sci-fi flicks, because it really isn't. In truth, the last time I attempted to watch it - when my wife bought it on DVD about a decade ago - I fell asleep. 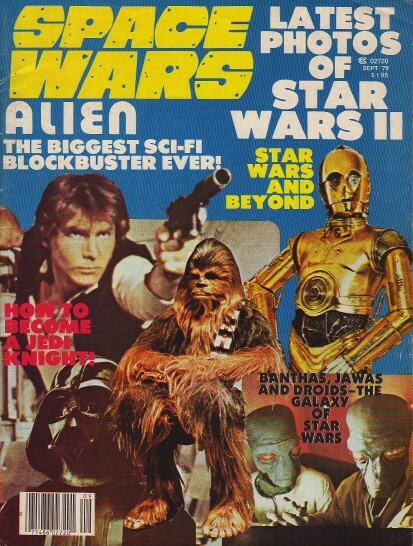 But, it is a nostalgic favorite of many Star Kids and it's clearly the studio's reaction to the tremendous popularity of Star Wars and Close Encounters of the Third Kind - two more-or-less adult films that were hugely popular with kids and sold lots of toys - from the previous year, so it does fit in here at Space: 1970. Here's a vintage TV Guide ad trumpeting its World Network Television Premiere on CBS. • Obit: I begin this Captain's bLog with some sad news. 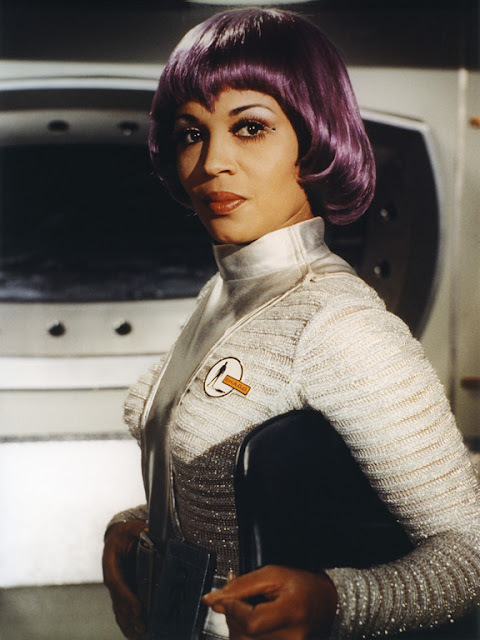 I've learned that actress Dolores Mantez, who portrayed lovely Lieutenant Nina Barry, the purple-wigged moonbase commander on Gerry Anderson's 1970 series UFO, passed away in November. She appeared in 23 of the series 26 episodes, with probably her most memorable appearance being in "Sub Smash," a tension-filled hour of drama where her character was trapped on a crippled SHADO submarine with Ed Bishop's Commander Straker and very little air. Although a busy actress on British television during the Sixties, she retired from acting in 1972 to devote her attentions to her family. Rest in peace, Ms. Mantez. 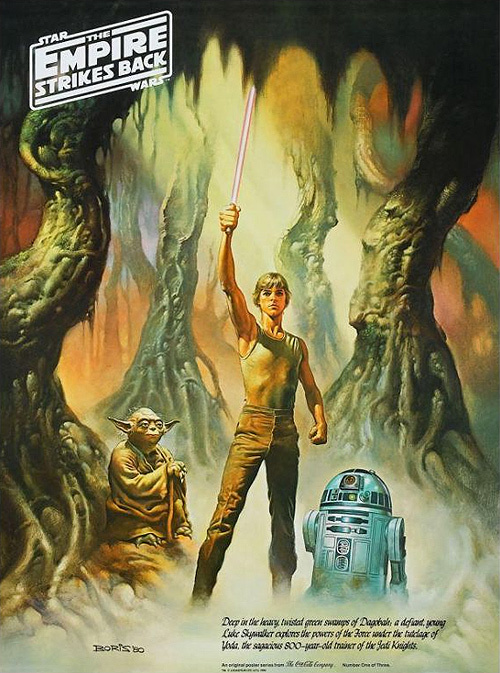 • Star Wars Graphic Novel Giveaway: While I remain disappointed in how few of the folks who entered actually followed directions - even after I repeated the instructions - I'm otherwise pleased by the overall response to this first Space: 1970 Giveaway. After disqualifying all the entries that didn't follow the rules, I randomly drew the winning name of Star Kid Mark Holmes, from far-off Willingboro, New Jersey. 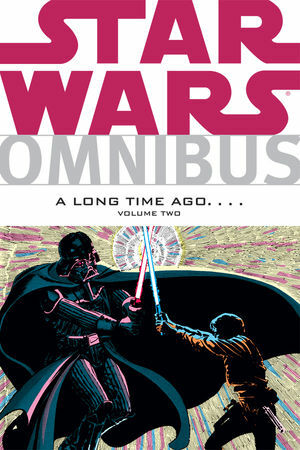 Sometime in the next few days, I'll be shipping out the Dark Horse Star Wars Omnibus Vol. 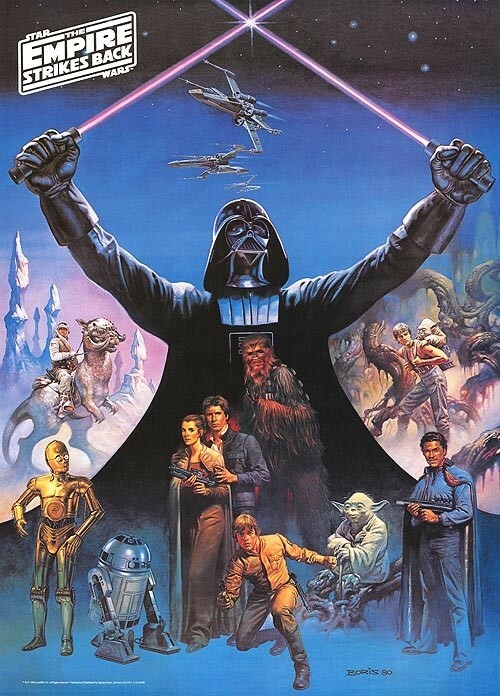 2 and the adaptations of Star Wars and The Empire Strikes Back. Keep an eye on the mail, Mark! 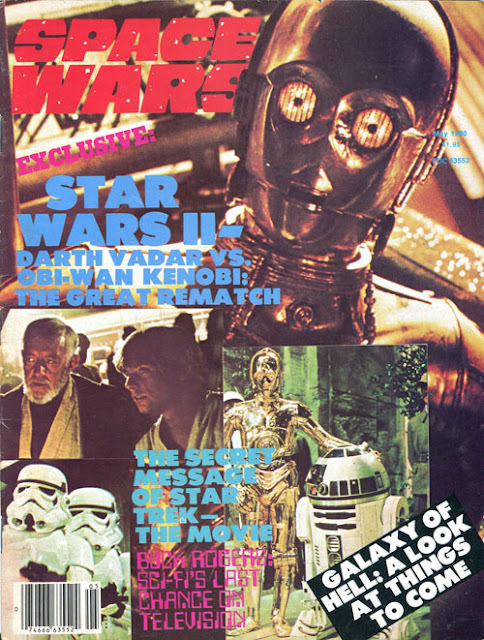 • Press: Last friday, Huffington Post blogger Jason Apuzzo wrote an article about the upcoming Disney Star Wars sequels and 70s science fiction cinema. 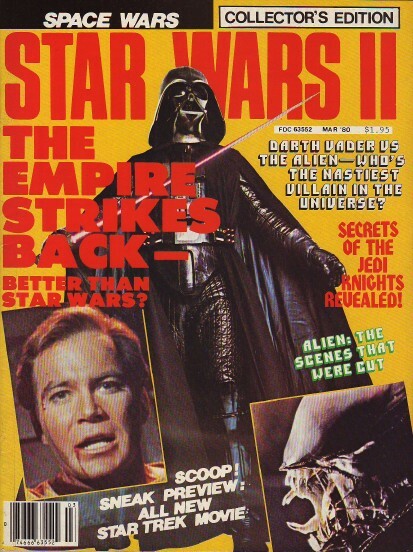 I enjoyed the article for the most part (especially the parts that seemed to be borrowed from - or at least influenced by - my writings here), but the best part was that he included a link to Space: 1970 at the end of his post. This resulted in a nice uptick in hits from new readers. Hopefully, some of them stuck around! * Check out the first Space Wars cover gallery HERE.